London – On 6 June 2018, BritishAmerican Business (BAB) presented its Corporate Citizenship Awards for 2018 to Jim Barber, Chief Operating Officer, UPS, and Jayne-Anne Gadhia CBE, Chief Executive, Virgin Money, in recognition of their exceptional commitment to corporate citizenship. The Awards were presented at a black-tie Dinner, which took place at Merchant Taylors’ Hall, City of London. BAB’s Corporate Citizenship Award Dinner is a highlight of London’s transatlantic business calendar, which brought together more than 150 influential business leaders from both sides of the Atlantic as well as other dignitaries including senior representatives from both the UK and US Governments and the Deputy Mayor of London for Business, Rajesh Agrawal. Past honourees have included Douglas Flint, Arthur O. Sulzberger Jr., Xavier Rolet KBE, Stephen McGill, Arun Sarin, Lord Browne, Peter Voser, Sir Martin Sorrell and Sir Michael Rake. 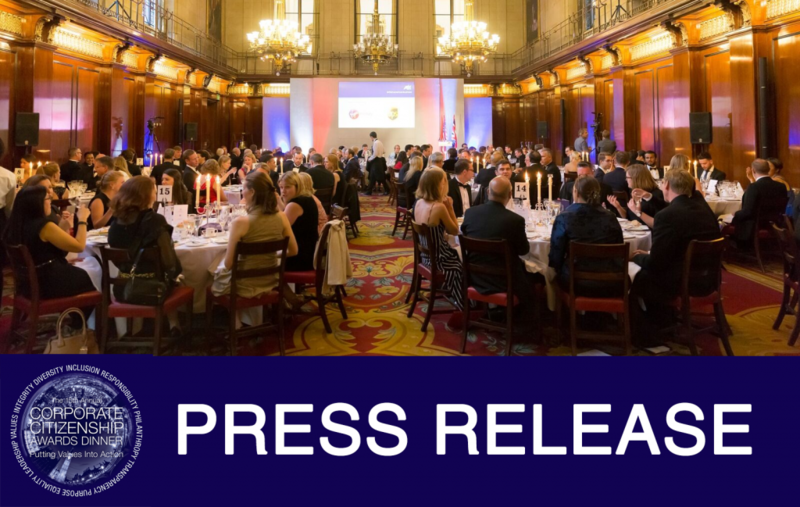 “BritishAmerican Business is proud to recognise Jim Barber and Jayne-Anne Gadhia for their outstanding contributions to corporate citizenship. Our two Honourees share outstanding business leadership with responsible decision making, as shown by the innovative partnerships and initiatives that mark their individual approaches to corporate citizenship. These leaders have put values into action to drive prosperity and economic development in local and global communities. “Purpose plays an important role in business today. And UPS’ smart global logistics network is built with the purpose of making global trade happen. But we go further. Our human and operational network also helps build stronger, safer and more resilient communities. UPS and the UPS Foundation partner with organizations around the world to support volunteerism which is core to UPS’s corporate citizenship. “At Virgin Money our ambition has always been to make everyone better off. This means that we always look for ways of doing things that benefit customers, staff, shareholders and the community. As such, I am honoured to receive the BritishAmerican Business Corporate Citizenship Award in recognition of all of the fantastic initiatives being delivered by my Virgin Money colleagues. The Virgin Money Foundation, led by Nancy Doyle-Hall has helped regenerate economically and socially deprived communities in our heartlands of the North East, Scotland and more recently Norfolk. In a very real way, the Foundation is helping to make lives better and driving positive change. And Virgin Money Giving, our not-for-profit online donation business led by Jo Barnett, was created to help fundraisers and charities raise more money for good causes. Since launching in 2009 it has gone on to help raise an incredible £600 million for charity and, because it is a not-for-profit company, more money goes directly where it’s needed most.